We adore mussels and while working together the other day Rebecca mentioned to us that she'd been for a meal at a well known Low Country shellfish eatery recently. This reminded us that in the 90's we used to troop all the way from Earls Court over to Camden just to eat mussels at the newly opened Belgian concept restaurant called Belgo's. This was the first branch to open in London and very cutting edge at the time but everything about going there was an experience which made the safari well worth while. The first surprise was that there was virtually no street front presence at all. You entered a discreet almost hidden door from the street and a high level walkway took you past all the open plan kitchens where everything was on view to the eating salon at the back. The room had wooden refectory style tables and the waiters were dressed in long flowing monks habits tied with rope. The menu boasted dozens of fruity Low Country beers - another innovation at the time and delicious with the shell fish - but as regards food only featured mussels, litre pots with a jus or "au gratin", grilled with bread crumbs or filet steaks and chips with the usual sweet and sticky desserts to finish.The formula was subsequently so successful it has been rolled out all over the nation. 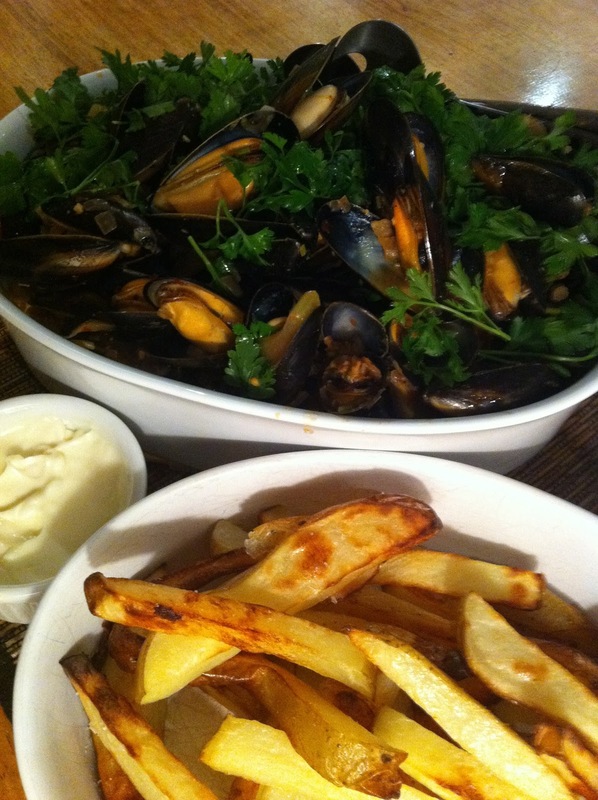 Belgo style moules and frites chez nous! Luckily we do not have to go to such lengths these days. Mussels are available in all the local supermarkets but we much prefer those on offer on the North End Road at our friendly Afghan fishmongers. Strange a landlocked and mountainous country straddling the roof of the world should spawn a football team of fish merchants who run not one but two shops within 500 metres of each other. Their fish is wonderfully fresh, great quality and reasonably good value. A kg bag of mussels costs less than £5.00 and the last time we bought one none of the shellfish had to be discarded. They also did not require cleaning or bearding and could be thrown straight into the pan. Each opened perfectly and was meaty and succulent just as you would like them! There are many variations on how they should be cooked but we always find as with all such good quality produce the simplest method is best. There are two classic avenues to follow, Moules Marinieres with white wine or Moules Provencale with a tomato based jus. There is a third possible route which is to go down the Asian track. To be honest my personal preference is for the Marinieres but you can google many different recipes and take your pick. The cooking principle is always the same however. Heat a large pan with a tight fitting lid on the stove. Pour in a little white wine and a half tsp of finely chopped garlic and a couple of chopped celery sticks. Throw in the mussels and close the lid. Toss around in the pan for two or three minutes by which time they should be done. Season and sprinkle with torn flat leaf parsley or coriander. This is a very basic method and as we say there are many more herbs and spices which can be added according to your taste. Just have a browse. At the restaurant frites are the classic accompaniment and you can't beat a little garlic and lemon aioli to dip them into. Heaven!